Much of my work relates to aspects of nature and human relationships with nature. I think about things from a biologist’s perspective as well as an artist’s. In the last few years, though, the materials for my work have moved away from the natural and towards the synthetic – reclaimed plastics and the like. I am not the only artist working with such materials, but perhaps my motivation is a little different to most. Here is the story of how I started including plastic in my baskets. It was 2008, and I was doing an Artist Residency at Primrose Park Art and Craft Centre, a former sewerage works in a northern suburb of Sydney. Outside the studio door was a large grassed playing field stretching down to the harbour shore. This had once been a coastal wetland, but had been “reclaimed” (i.e. filled in) using landfill covered with turf. At the time I was also working as an environmental educator at Sydney Olympic Park, another area where wetlands had been destroyed by this “land reclamation” process. I use the inverted commas because I don’t like the term. “Wetland destruction” would be more apt. Anyhow, I had some background knowledge of how these parks were originally constructed. In the past couple of hundred years Australians have often used coastal wetlands as rubbish dumps, and plenty of rubbish would probably have been included in the landfill used to raise up the playing field of Primrose Park. I was thinking about all the layers of stuff that might lie just underneath the grassy surface, and how I could represent these in my basketry work. It occurred to me that I might as well use exactly the same materials that were under the park; a combination of organic and synthetic. 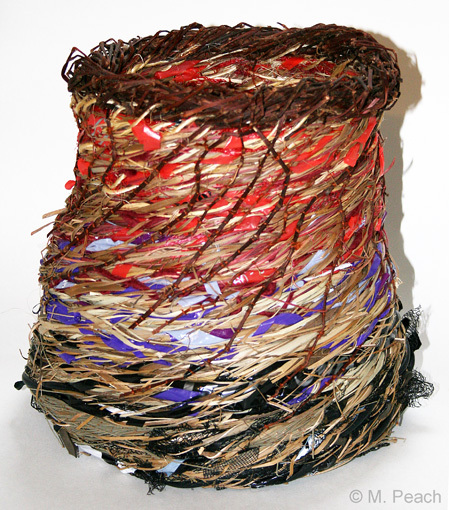 So I began to include strips of plastic, leather, fabric, metal, etc, in coiled baskets along with the usual plant fibres. Here are some pictures of the baskets I made during this time. “Reclamation” and “Persistence” were the first baskets I made this way. I used different coloured materials to refer to different chemical layers in the sediment; black for areas without oxygen, red for areas rich in iron, white for deposits of calcium carbonate from marine creatures, yellow for sulfur compounds. The layers aren’t necessarily arranged in a biologically realistic manner – a bit of artistic licence was involved, as I wanted to create an aesthetically appealing gradation of colours. In “Persistence”, the rim is made from knotweed, one of the many weeds flourishing in the bushland around Primrose Park. Representations of its roots reach down through the layers of the basket. 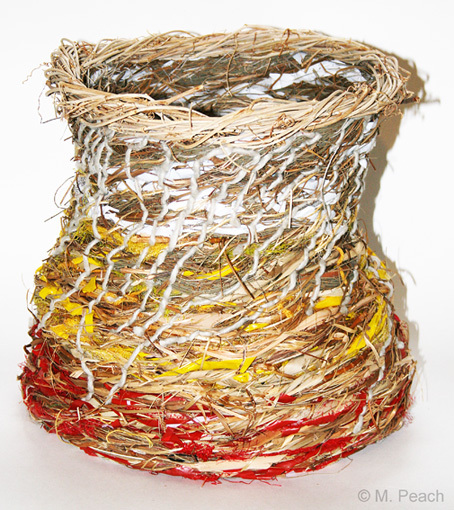 For those interested in the technical details of basketry, the coiling method used here was not a traditional one. I have disguised the stitches so that the baskets look almost like they were randomly woven rather than coiled. I used nylon fishing line for the stitching material, and made the stitches diagonally through the tightly twisted core materials, so that the stitches are almost indistinguishable from the other materials. Finally the random weave rim was stitched on top, and the “roots” stitched onto the outside. a basketmaker after my own heart. it upsets me a great deal to see people pave over everything, to fill in wetlands, to “tame” the untamed. they think if it is not under the hand of man, it is not good, somehow. i also rankle at those who think recycling is turning a new package of t shirts into pillows. that is NOT recycling. i love the concept behind these very simple basket forms, and how you articulated your ideas. thank you so much for posting them. i have always collected stuff that would otherwise just be thrown away, and longed for ways to use them in my artwork. it is a challenge that i have not been able to rise to the way i would like. thank you for the encouragement and inspiration!